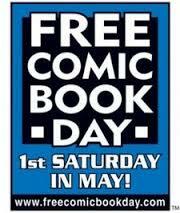 The sixth annual Free Comic Book Day has come and gone, friends, but the memories remain. Although Chase couldn’t make it today, guest host Mike Bellamy joined Blake at BSI Comics for a special on-location episode to talk with the staff and customers of their local comic shop about FCBD, getting kids into comics, why Blake can’t tell a Storm Trooper from a Snowtrooper, and everything to do with comics and movies. This entry was posted in Showcase Podcast and tagged Free Comic Book Day, Star Wars. Bookmark the permalink.